Embark on an Indonesian odyssey through exotic locales while marvelling at volcanic landscapes, greeting orangutan families at Camp Leakey and exploring picturesque islands, aboard Silver Discoverer's 11-day voyage from Balikpapan to Singapore. Departing on 18 October 2016, Silver Discoverer navigates through the Java Sea to port at Tanjung Wangi, Pasuruan, Sumenep and Karimunjawa before sailing to Kumai (Camp Leakey). Silversea is offering its guests a rare and unforgettable opportunity to visit the world famous Camp Leaky and visit exclusive parts of the nature reserve usually closed to the general public. 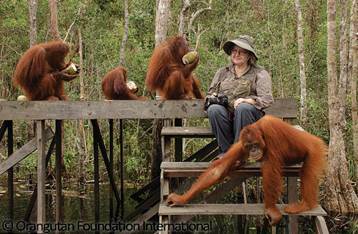 Located in the Tanjung Puting Reserve (now a National Park) in Central Borneo, Camp Leakey is devoted to the conservation of wild Orangutans and their rainforest habitat. Following a day at sea, Silver Discoverer then arrives at Kepulauan Banda, a group of islands in the Tudjuh Archipelago where guests can enjoy the spectacular underwater world with a swim, snorkel or scuba dive through the turquoise waters surrounding the islands. This voyage concludes in Singapore with guests disembarking on 29 October 2016. · Published fare starting from AU$14,550. · Early Booking Bonus fare starting from AU$13,095. Silversea Expeditions' fares include: all shore and Zodiac excursions hosted by an expedition leader; all-suite accommodation with butler service; gourmet meals with menus inspired by Relais & Châteaux; complimentary wines, Champagne and spirits served throughout the ship; an outstanding expedition team of expert guides and lecturers; complimentary WiFi and all gratuities. For each guest taking part in this voyage (V9623), Silversea Expeditions will donate US$100 to Dr Galdikas' non-profit Orangutan Foundation Intl (OFI). This voyage is subject to availability. Terms and conditions apply. Diving conditions apply. For more information, contact your travel professional or Silversea Cruises on +61 2 9255 0600 or 1300 306 872 or visit www.silversea.com.